that's good work. i'm not a fan of apple or jobs. or perhaps, i mean that i'm not rich enough to afford apple, so i hide this through resentment. i quit liked this though, although i don't know how good / bad it is for a ceo to be this much in the detail. I feel a bit bad - did paga kill Jobs? I think we killed Jade Goody too. The Shadow wrote: I feel a bit bad - did paga kill Jobs? I think we killed Jade Goody too. If that was true, I'd die of exhaustion from the constant posting. Morgan, Cameron, Clarkson, etc. Speaking of death - I'd been meaning to post this photo I took with my phone in a Peterborough nightclub a couple of years ago. 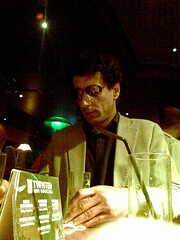 You don't often see Colonel Gadaffi clubbing. And now you won't see him again. Last edit: by Mr Recommendo. That's excellent. I wish I had the nerve to do that. There were a couple of people on the train a couple of months ago that I wish I'd recorded for posterity. There was Elvis and German Holly Johnson but it means nothing without the pics. You know this new ipad thing? Isn't it going to be a bit impractical to carry around? Last edit: by Foxy Jim`ll.